Customers placing their orders at OldTown White Coffee at Suntec City. SINGAPORE - Enter OldTown White Coffee at Suntec City, and the built-in camera in the self-ordering kiosk scans your face. Your name, favourite orders, past purchases, how you take your coffee, and personalised recommendations flash up on the screen. This high-tech facial recognition system that helps identify regular customers and take their orders under a minute is one of the new innovations at the latest OldTown White Coffee outlet, which opened in September. It is among the slew of moves by eatery chains to capture the hipster market. They are known for local food offerings such as the quintessential kopi, soft-boiled eggs and toast, but these brands are switching things up to appeal to younger diners hungry for selfies and smoothies. These include better technology to ease operations, new menu offerings and modern interiors for the Instagram generation. Even with the improvements, prices remain affordable - from $2 for a cup of hot coffee, and an average of $10 for a meal. The 88-seat Suntec City outlet was launched after Dutch tea and coffee giant Jacobs Douwe Egberts' $488 million acquisition of the OldTown Group in May. 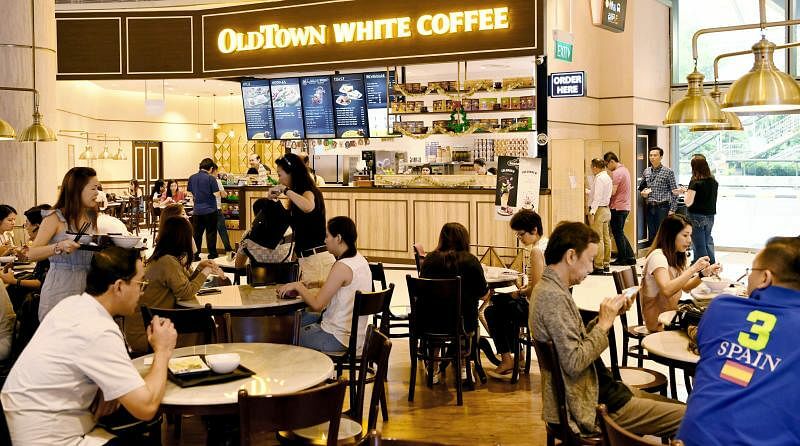 The OldTown Group - Malaysia's largest halal-certified kopitiam restaurant chain that was established in 1999 - runs the OldTown White Coffee chain, which has 243 outlets in Asia, with 10 in Singapore. The Suntec City outlet has a sleek look, with brass lights and textured light oak walls that would not look out of place in any fancy mall. Its menu also features new drinks and dishes like popcorn white coffee latte and salted egg butterfly prawns nasi lemak, alongside traditional favourites such as Ipoh chicken hor fun and beef rendang nasi lemak. Sales executive Kenneth Tan, 27, who works in Suntec City, says: "The self-ordering kiosks are easy to use, although I have yet to try the facial recognition system. I'm not too keen on the cold brew coffee drinks, but I do like the new popcorn white coffee latte. The space is also good for having meetings." The next OldTown White Coffee outlet to revamp and follow the Suntec City model is at City Square Mall. Over at Takashimaya Shopping Centre, the 70-seat local cafe Heavenly Wang, which opened in April, sports a more hip interior with neon signage. A high table with ample power points cater for students or working professionals to use their laptops. The halal-certified Heavenly Wang chain, established in 2012, is the more upmarket sister brand to the Wang Cafe chain, which first opened in 1953. There are 21 Heavenly Wang outlets. 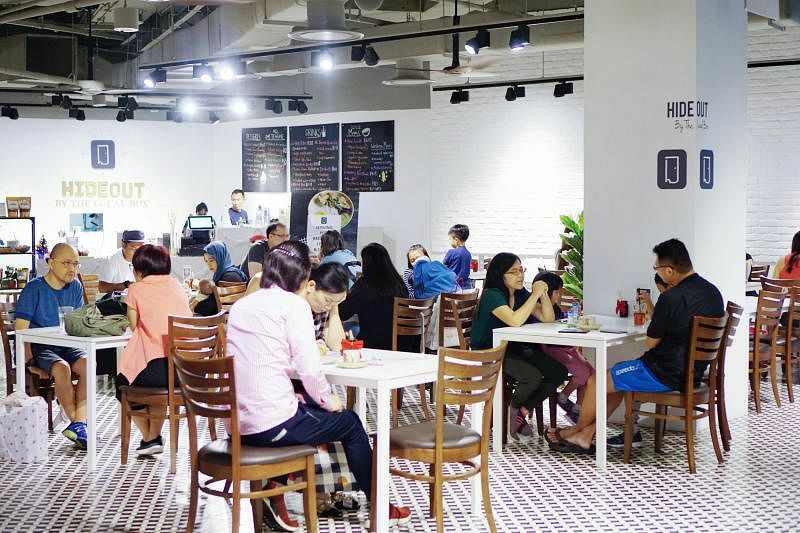 Mr Nicholas Pang, 43, assistant general manager of Wang Cafe, says they were approached by the mall management to open an outlet with a more "casual and modern vibe". After all, it is situated along a stretch of trendy food outlets including chocolate dessert cafe The Dark Gallery; Project Acai, which sells acai bowls; and Mos Cafe by fast-food chain Mos Burger. Old-school elements such as the biscuit tin wall and metal gate remain, Mr Pang says, purely to "retain the nostalgia for the older customers", like a form of retro chic. Other Heavenly Wang outlets that are slated to be renovated will take on similar modern touches from the Takashimaya Shopping Centre branch's. As for The Local Box cafe in Tanjong Pagar, it is continuing to bank on local flavours for its new outlet at The Heeren, called Hideout by The Local Box. Founder Samantha Tan, 25, chose to open in Orchard Road as she noticed a "lack of modern local food" in the area. The six-week-old Hideout takes on a "more minimalist look", compared to the more nostalgic decor at the Tanjong Pagar outlet, which opened in September last year. Hideout's menu is also an extension of The Local Box's best-selling dishes such as ayam rendang nasi lemak, and dry laksa with toasted prawns. It also sells more desserts. Ms Tan adds: "People are just so used to the idea of a cafe serving Western food, and likewise for a hawker stall to serve local food only. We want to change that mentality but ensure that we do not miss out on those simply craving for their big breakfast or aglio olio, or a good cup of kopi. Local food and drink will always remain relevant to Singaporeans of all ages, and that's what cafes should head towards." Indeed, diners are catching on to the variety of food options available. Marketing manager Janice Tan, 34, who discovered Hideout on a shopping trip to Robinsons at The Heeren, says: "It's not easy to find quiet spots in Orchard Road, and the selection of food is very reasonably priced. I like that I have the option of having cake with local coffee for tea time, instead of the usual toast. With more options, I'm more likely to come back." As for housewife Mavis Lim, 65, who frequents Heavenly Wang at Takashimaya Shopping Centre, she says: "I would still order my traditional kopi and toast, but when I come with my grandchildren, they want to have the ice blended drinks and thick toast. It's a convenient spot and a brand that we are familiar with so I'm more comfortable here than going to a fancy cafe." What: New coffee flavours include Popcorn White Coffee Latte ($4.90) topped with popcorn, and Coconut White Coffee Latte ($4.90), topped with toasted coconut flakes. Cold brew white coffee with sparkling soda options are available, such as Sparkling Mango Coffee ($5.90) and Sparkling Orange Coffee ($5.90). What: Switch it up from the usual kopi and toast with ice-blended drinks such as mixed berry ($5.80), pink guava and pineapple ($5.80), and strawberry and banana ($5.80). What: This second outlet by the founders of The Local Box cafe in Tanjong Pagar offers more Asian Western fusion dishes. These include mentaiko pasta with teriyaki chicken skewers ($15.90) and har cheong gai (prawn paste chicken) nasi lemak ($9.50), alongside favourites such as soup onsen egg mee siam ($6.50, above). Hideout also features a dessert line in collaboration with Le Le Zhan Desserts from Katong Shopping Centre, with ice cream flavours such as chendol ($4.50), pulut hitam ($4) and cheng tng ($4).